For some families, the hall closet can quickly become a dumping ground. If you're ready to transform your messy hall closet into a closet worthy of showing off to company, follow these simple steps to closet organization! Identify what the closet is being used for based on its location — seasonal items such as coats and rain boots? Linen closet overflow? Narrow it down as much as you can. Purge the closet of its contents. Throw away or donate items that haven't been touched in years, and place items like board games in a more functional spot like the playroom. Organize the items before putting them back into the closet and create a plan for accommodating them. Do you need hanging space? Space for luggage? Could you use additional shelving? A place for shoes? Make use of the space on the door. Install an over-the-door organizer like an Elfa Utility Door & Wall Rack. 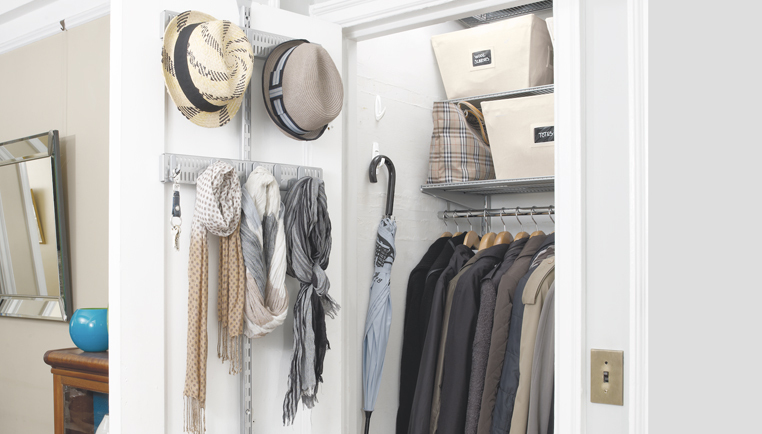 You'll love being able to organize small items like gloves, umbrellas, hats and bags. Choose a storage system that's flexible so it can accommodate your changing needs. Note obstructions in the space you need to work around. Take measurements. Plan your closet so that the most frequently used items are most accessible, and the least frequently used items are on top shelves. Remove old shelves and rods; patch and paint walls. Evaluate lighting and replace/update fixtures if necessary. Install a custom closet system like Elfa. When putting items back in the closet, keep things organized by season and/or function and refer to your original plan. Choose hangers, storage boxes, shoe storage options and accessory organizers to complete the solution. Clear containers or those with labels will help you save time because you can quickly identify the contents.